The Sharjah Chamber of Commerce and Industry (SCCI) has announced that the winners of the Sharjah Economic Excellence Network (ShjSEEN) Award 2018 will be revealed on Wednesday during a ceremony organized by the chamber. The award ceremony will be held at Expo Centre Sharjah, under the patronage of His Highness Sheikh Sultan bin Mohammed bin Sultan Al Qasimi, Crown Prince and Deputy Ruler of Sharjah. The announcement took place during a recent meeting between the board of trustees for the award, which was held at the headquarters of the Sharjah Chamber of Commerce and Industry. 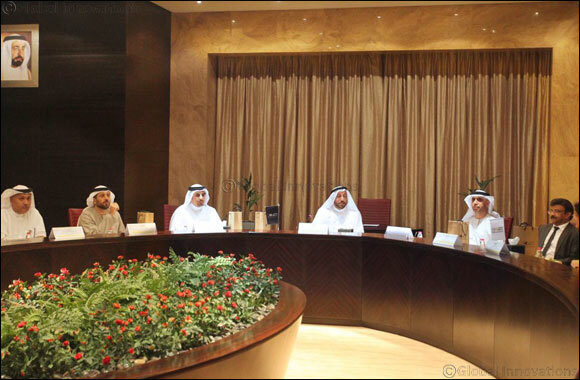 The meeting was headed by HE Abdallah Sultan Al Owais, Chairman of the Sharjah Chamber of Commerce and Industry. The meeting was also attended by members of the board of trustees for the award, as well as HE Mohamed Ahmed Amin, Acting Director-General of the SCCI; and Nada Al Hajri, General Coordinator of ShjSEEN. During the meeting, the board reviewed the results of the 3rd edition of the award, and the assessments of both participating individuals and enterprises, as well as the new developments of the award. The winners of the different categories of the award for the year 2018 were also approved during the meeting. HE Abdallah Sultan Al Owais, Chairman of the Sharjah Chamber of Commerce and Industry, stated that the award is one of the most prominent initiatives for the chamber, which receives a lot of support from the wise leadership. He remarked that the chamber is keen on continuously developing the award and enhancing its status both locally and regionally, in accordance with both the economic vision of Sharjah and the strategic directions of the country. He also praised the efforts of the evaluators, assessors, and the entire team behind the award for their efforts in achieving the objectives of the award. Nada Al Hajri, General Coordinator of ShjSEEN, reviewed the different stages of the 3rd edition of the award, including all of its initiatives and training programs that were accredited by the European Foundation of Quality Management (EFQM), as well the field visits that were organized to evaluate the economic establishments participating in the award within the UAE and the gulf region, in addition to the award's field assessment and evaluation phases. She added that the Board of Trustees of the Award approved the final results that were submitted recently by the assessment committees, and the list of names for the winning establishments and individuals was determined based on the committees' assessments. The Sharjah Economic Excellence Network Award aims to promote corporate governance, encourage the adoption of quality standards and business ethics, develop the responsibility of private sector enterprises towards society, and enhance the role of economic institutions in promoting sustainable development by providing facilities and launching new projects and initiatives.